You: Actually, there’s evidence behind low carb diets Friend: Oh, that’s cool. Wanna get some ramen? You: Actually, the evidence I’ve seen on low-carb diets is super interesting! Randomized trials tend to show equivalence to other diets, or even a slight advantage. 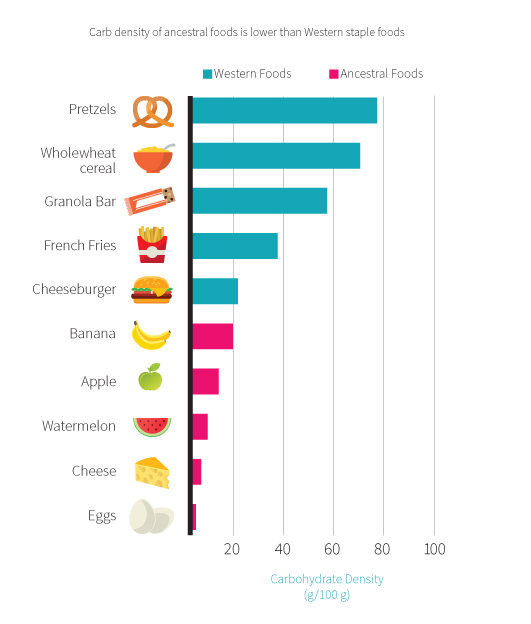 But the takeaway isn’t straightforward -- low-carb diets greatly reduce the number of snack food options you have, so that in and of itself could help with weight loss, outside of any physiological difference. And while very-low-carb ketogenic diets have a lot of therapeutic potential, the two most recent trials have shown ... Friend: Shut up and take my money. But first tell me everything you know. Okay, so maybe that’s a bit dramatized. And some people don’t want to know all the details. But when you run across someone that does, and you teach them something they can actually use or that opens their eyes to the wonders of scientific research? Priceless. Here’s an example of a nerd power-up that you can use. In other words, something that might seem simple to the average Joe or Jane, but have incredibly interesting facets that you’d only know by reading the research. By the way, we cover roughly a million of these in our research digest each month, which is a publication that physicians, dietitians, and nerdy lay people have used for the past two years to keep better informed for their clients and themselves. Today’s actually our two-year anniversary, by the way, so in the next 72 hours, you can get ERD on sale for $19.99/month until Saturday, November 5th. Let’s look at one aspect of that old supplement staple: fish oil. Everybody knows that fish oil is healthy, right? Wrong. Fish oil is neither inherently healthy or unhealthy. The long-chain fatty acid molecules (EPA and DHA) have many spots that can be attacked/oxidized. This is helpful for their functioning as signaling molecules in the body, but it also means that you might want to avoid overconsuming fish oil, especially if it’s a bit oxidized. After all, when a fat gets really oxidized, it’s also known as rancid fat. Alright, so you know to avoid eating too much oxidized fish oil, such as by avoiding humungous bottles of discount fish oil, which start auto-oxidizing as soon as you open the bottle, and may have some problems even before then. But there are more problems. 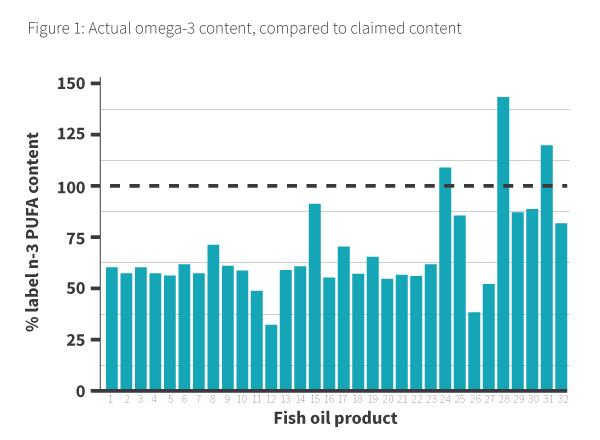 We analyzed a study showing just how many fish oil bottles on a typical store shelf meet their label claims, and the results were pretty mind-blowing. Nearly every single bottle had less EPA and DHA than it claimed! There’s a heck of a lot more to the fish oil story than any one study can show (correlations between cost and quality, or lack thereof, fish oil reducing the efficacy of chemotherapy, hundreds of heart health studies, etc etc), and perusing the 729 (and growing) citations on our fish oil page makes it obvious that even one single supplement can have quite complex research behind it. Saying, “Hey, I saw a study on fish oil” is not a substitute for deeply analyzing the actual study methods and results, and finding out if and who the conclusions apply to. If you get intimately familiar with research, people will listen, and your ability to help people will grow quickly. Almost a thousand years later, nearly every Internet nutrition guru ignores this advice. No wonder “guru” is such a loaded term these days -- the more sure you sound, the greater your following can be. 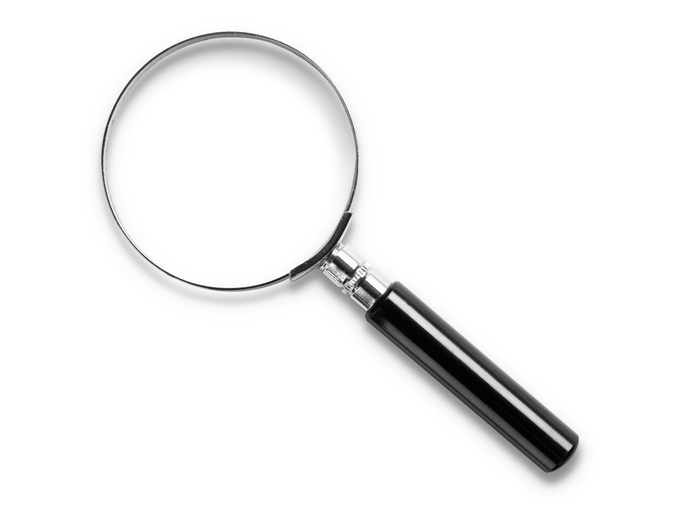 Examine.com doesn’t have an opinion about things, because we go by the evidence, and change our entries when new evidence comes out. So we’re unlikely to attract people looking for quick fixes, who want to be saved from their unhealthy lifestyles by a magical supplement. But on the flip side, many of our readers are incredibly deep thinkers. Let’s take a common issue that comes up on a daily basis: junk food. 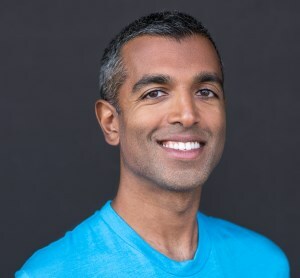 If you preach to your friends and family about the dangers of sugar and fat and processed food, the end result is less likely to be deep learning, and more likely to be you not being invited to potluck dinners. Now let’s say that you take a step back and forget your assumptions. What are the major things that can make a food unhealthy, and what amount of an ingredient is needed to reach the “unhealthy” threshold? Here’s a hint: neither sugar nor fat are inherently unhealthy, which is a common theme in nutrition. And while processed food isn’t inherently unhealthy either, there are some serious considerations in modern life that research has uncovered. For example, people eat hundreds of pounds of processed flours and sugars every year. Meaning, not sugar naturally found in a fruit or sweet potato or some other plant. These processed carbohydrates are called “acellular” because they are not found in a plant cell, like sugar in a blueberry would be for example. When you eat a lot of acellular carbohydrates, it not only becomes easier to eat a lot of calories quickly without getting satiated, but it introduces dense sources of carbohydrate into your intestine all at once. That’s not a recipe for a healthy gut. Now this doesn’t mean flour is “bad”, or sugar is “more addictive than heroin so you better be scared homie”. Those are scare tactics that distract from the more complex issues that matter. But you don’t want to be messing with your gut bacteria by feeding it this kind of stuff on a regular basis, aside from the increased likelihood of weight gain. You’re smart. Don’t downplay your ability to learn and understand complex issues. But be humble when conveying knowledge to other people, and take a step back to consider multiple factors. Things are bound to be more complex than even experts are aware of. This one is simple. If you go up to people at supermarkets and give them unsolicited nutrition advice, you are a fool. Speaking of: people often tell me how unhealthy white rice is, not realizing I’ve been analyzing studies on food and nutrition all the live long day (and occasionally publishing some of my own), stretching back for years. Yet white rice is not much different than brown rice in terms of glycemic index, brown rice is not especially rich in nutrients, and a balanced meal with white rice can easily be lower-glycemic due to fat and fiber in other ingredients. Please don’t tell someone how unhealthy their food is. At the very least, discuss the topic WITH them, rather than lecturing AT them. This is why nutrition research is so fun, but also useful. Researching the Higgs Boson might help you unravel the mysteries of the universe, but its practical significance in your life is … questionable. Researching your fantasy football roster can help you gain (a little bit of) fame and (very small amounts of) money (for the excessive time you spend researching). But it won’t help your family or friends, at all. Upping your nutrition research game helps everyone, and it’s fun to boot. Plus your friends and family WILL be impressed by at least one thing you learned, and there’s a decent chance you’ll help someone make healthier choices. Let’s wrap up with one last example of a practical tip discovered by nutrition research. Vitamin C is typically thought of for cold prevention. But one of the coolest uses for vitamin C is totally unrelated to that. There’s a condition called Chronic Regional Pain Syndrome (CRPS) that is one of the most painful things known to humanity. For some people with the condition, which often starts after an injury, a gust of wind across the affected body part can hurt so bad they have to go back inside. The pain can far exceed that of childbirth. In other words, it’s terrible. Guess what’s the only thing that has decent evidence for preventing CRPS? Simple, cheap vitamin C. Just 500 mg a day for a month or two after you get injured. Talk about high reward, low (actually zero) risk! Nutrition and supplement research is chock full of practically useful information. Everyone knows someone with health issues who could benefit from more knowledge. It’s your duty as a smart person to spread that knowledge, without being a know-it-all jerk about it. If you get especially interested in keeping up with the latest studies, there really is nothing quite like the Examine.com Research Digest, in which we break down the studies for you from every imaginable angle using a variety of researchers, physicians, and people with different expertises. Want to stay on top of the latest studies? Click here to get ERD.